There’s a lot of good information in the linked article. Fingerprint technology is still the most ubiquitous biometric technology worldwide and it will be for some time. Biometrics will ultimately be an all-of-the-above industry where the application determines the biometric modality/modalities brought to bear. The new TouchPads would be able to read your fingerprint to enable Windows 10’s new biometric login feature Windows Hello, which aims to eliminate the use of passwords by replacing them with either fingerprints, facial recognition, or iris scanning. 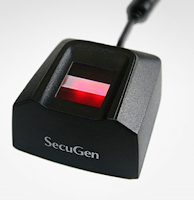 Morphing the touch pad mouse sensor hardware into a fingerprint reader would be pretty cool. Getting the ID transactions right, though, will be a pretty heavy lift, technically, depending on the use model. Those who signed up for the test went through an enrollment process that took about 20 minutes. After that, they were permitted to use their fingerprints to access the TSA screening area through the CLEAR lane. Fingerprint readers at the boarding gates were able to pull up a passenger’s boarding pass for the gate agent to review. With the Colorado Rockies stadium access, that’s news of two innovative CLEAR deployments in two days. U.S. Customs and Border Protection officers began using the devices last week to scan some foreign passengers on selected flights at Hartsfield-Jackson Atlanta International Airport, agency spokeswoman Jennifer Evanitsky said Tuesday. The test will be expanded in the fall to airports in Chicago, Dallas, Houston, Los Angeles, Miami, Newark, New York, San Francisco and Washington. The US Congress first required such a system in a law passed in 1996. Though the idea of hacked fingerprints conjures up troubling scenarios gleaned from Hollywood’s panoply of espionage capers, not much is currently known about those that OPM said were swiped in the data breach, which began last year and has been privately linked by officials to China. In fact, the agency said it didn’t even know yet specifically which personnel have had their prints compromised. The linked article is really good in that it spends a great deal of analysis of the unknowns, and there are many. While a collection of images of the fingerprints of US government employees — if that is an accurate description of that was taken — certainly has its uses, not all potential uses are equal or equally likely. In terms of identity fraud, the 1.1 million government employees who had their fingerprints stolen may not be a whole lot worse off than the 20 million or so other government employees who had their personal information stolen minus the fingerprints, though that is cold comfort indeed to the victims. If the individuals whose information was stolen are given the precise details of the personal information that is now “out there” they will be able to make informed decisions about how they wish to manage their affairs going forward. That includes how they might interact with biometric ID management technologies in the future both in and outside of government applications. The intelligence value of the fingerprints of government employees is different story. With time, money, and pictures of a million fingerprints, it is possible to build a fingerprint watch-list. Probably, not all of the pictures of fingerprints will be of a high enough quality to be enrolled in an automated system today but more time and more money could help. From there, the new watch-list could be accessed by a new or existing biometric ID technology deployment such as a checkpoint serving whatever purposes its owner has for it. There is probably a lot the government still doesn’t know about what was stolen, and even more that hasn’t been shared with the public and more importantly with the individuals whose information has been compromised. It will also take some time for the stolen information to be put to use. The Office of Personnel Management has a lot of work ahead of it. The law was passed in part to prevent identity theft and the loss, theft and destruction of the blue ID cards issued by the Interior Ministry, which had spiraled out of control in the decade prior to 2007. It was later revealed that more than half of those requesting new documents had a criminal background. Citizenship and Immigration Canada told CBC News that digital photos and fingerprints are “the only biometrics data applicants will have to provide” under the government’s plan for expanded collection of data. Visitors will have to pay $85 to cover the cost of data collection. Travelers who don’t need a visa to travel to Canada are, apparently, unaffected. Video (no audio) at the link. Also, there is no mention of the fingerprint hardware used. Still, if you’ve never seen a fingerprint enrollment before, you can see one now. Paul Sawyier Public Library implemented a biometric identification system in October 2008. Since then, patrons who sign up for a library card have the option to enroll in the finger identification system, which is required only when using the public computers and the media box located in the lobby. To check out materials or log on to computers using the system, a patron simply places his or her finger on the biometric scanner located at each station. Patrons checking out other materials can use their library cards as they always have. Earlier versions of the optical fingerprint reader were much taller. Authorities in Florida say a ruse to get a man’s fingerprints led to his arrest as a convicted killer who escaped an Ohio prison farm and disappeared for most of six decades. Brevard County deputies say investigators with the U.S. Marshals Service in Ohio sought help to check out the man while chasing leads about Frank Freshwaters, an Akron man who escaped in 1959. Major Tod Goodyear says they created a ruse to get the man to sign papers, then matched the fingerprints to those from the decades-old arrest. Here, Richard Walters, GM and VM at Intermedia, expands on Whaley’s criticism, claiming that the biometric technology offered by Apple is not secure enough to support sensitive activities like mobile banking. Very much worth reading in its entirety. OnePlus Two release date, specs: highly advanced biometric scanner (Christian Today) — OnePlus’s hardware naming convention is sure is going to be fun! I wonder how the oversight was discovered. There’s so much going on in the article that I couldn’t settle on a key paragraph to set it up. Long-time readers will find some of the details familiar, especially the parts dealing with Kenya and Ghana. ASUS ZenFone 3 Will Have a Fingerprint Recognition Sensor – Rumor (Softpedia) — It looks like pretty much all smartphone manufacturers will be offering models with fingerprint sensors soon.